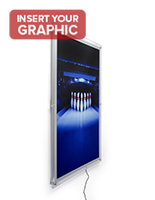 This LED poster wall frame features brilliant energy-efficient backlighting and an elegant, modern design that attracts customer attention to 24" x 36" signage in any environment. 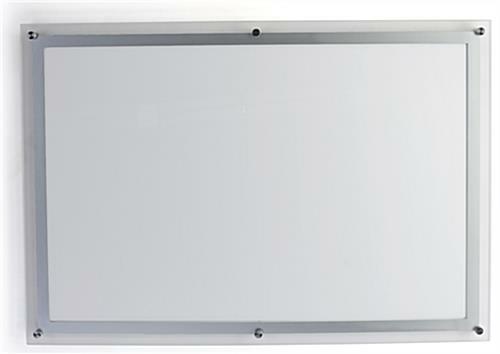 Each low-profile fixture comes with a silver-edged acrylic faceplate, laser-engraved light guide for even illumination, and a 114" power cord for flexibility of placement. 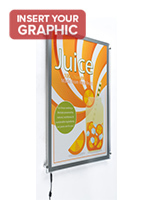 This backlit poster wall frame for 24" x 36" translucent graphics is ideal for installation in high traffic areas such as lobbies, entryways, concourses, walkways, and commercial or showrooms. 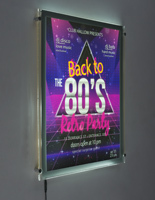 This type of illuminated signage holder is perfect for showcasing advertising, marketing, and branded graphics as well as wayfinding or event information. 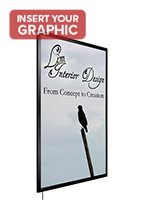 This 24x36 poster wall frame's standoff-mounted design and silver edging give a modern, stylish feel to commercial advertisements or signage. 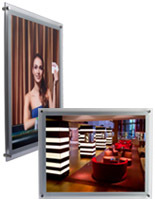 This high visiblity framing provides an average of greater than 4000 LUX, while the laser-engraved light guide offers brilliant, even backlighting without hot or cold spots on duratrans or other translucent graphics displays. 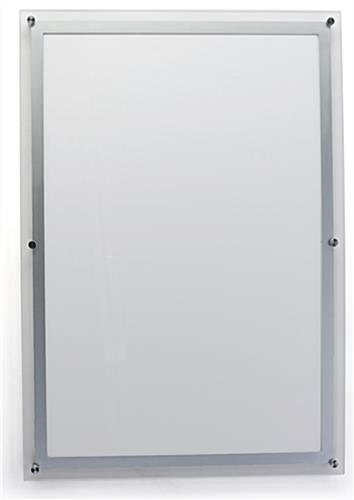 27.0" x 39.0" x 1.5"